Apartment living is great, but there are some inevitable downsides to it — like rent, lack of privacy, and what tends to be a small space. Plus, if you love the outdoors, you don’t have a ton of access to it as an apartment dweller, since you probably don’t have a yard. But there are ways to bring the beauty of nature into your apartment (no matter the size) with this list of some of the best plants for apartments. You can never go wrong with herbs and succulents in an apartment, because they provide instant joy and don’t take up a lot of space (a kitchen windowsill should do). But if you have more room in your apartment, then you can definitely expand your plant horizons — especially today, on Plant Appreciation Day. Even if you aren’t particularly gifted at keeping plants alive, there are major advantages to having them in your home. Besides plants being pretty (particularly flowering plants), there are health benefits to having houseplants. As NBC News reported, studies have shown that houseplants can help increase concentration and productivity while decreasing stress. And NASA has explored how plants can purify the air. Their studies have shown that plants can remove toxins such as benzene, formaldehyde, and even ammonia. (You can check out the original 1989 NASA study here.) Plants are also credited with being natural mood boosters — because who doesn’t feel just a little bit happier sitting in a garden? If you’re looking to bring a little more natural joy into your living space (with not a lot of fuss), these 12 plants will fit right in — even if you don’t have a ton of living space. Air plants are a bit trendy, but for good reason. These simplistic plants don’t need dirt to add a natural design element to your space (plus, half the fun is picking out the container you’ll put it in). No dirt? No problem with air plants. Jade plants can live for years — and that’s particularly good since they are a symbol of good luck. If you’re looking for a plant with function, look no further than aloe. It provides a soothing balm for burns and it’s included in NASA’s list of air purifying plants. Add all of that to the fact that it’s outrageously easy to grow and aloe in your apartment is a win-win-win. Japanese bonsai trees notoriously require a lot of care, but when you are just starting out, they are the perfect size for a small apartment — and a great conversation piece. Succulents are ideal for apartment living and the paddle plant (or flapjack plant), with its fun shape and rich colors, is no exception. If you have a bright apartment and want a pop of color, then African violets are for you. Just be careful about how you water these beauties. Beyond the air purifying benefits that snake plants have, they are also resilient. Even in an apartment, you’re unlikely to kill it, but watch out — these scrappy survivors might outgrow your space. This furry succulent will win your heart, just like the animal it’s named after. There are tons of apartment- and recipe-friendly herbs like basil, cilantro, thyme, chives, and oregano that will not only spruce up your kitchen, but they’ll save you money at the grocery store too. The name might throw you off, but the baby tears plant is like a little bundle of joy. And, if you prefer, it also goes by the names peace-in-the-home and mind-your-own-business. The cactus is a standby for a reason — you don’t need to worry about regular watering for a prickly addition. Architectural Digest even gathered a list of the best cacti for indoors, which will help you if you’re indecisive about what to choose. After this list, are you even more of a sucker for succulents? Then you may want one from the genus echeveria, which are the succulents that look like tiny flowers. Not only are they strikingly gorgeous, they’ll last far longer than actual cut flowers. 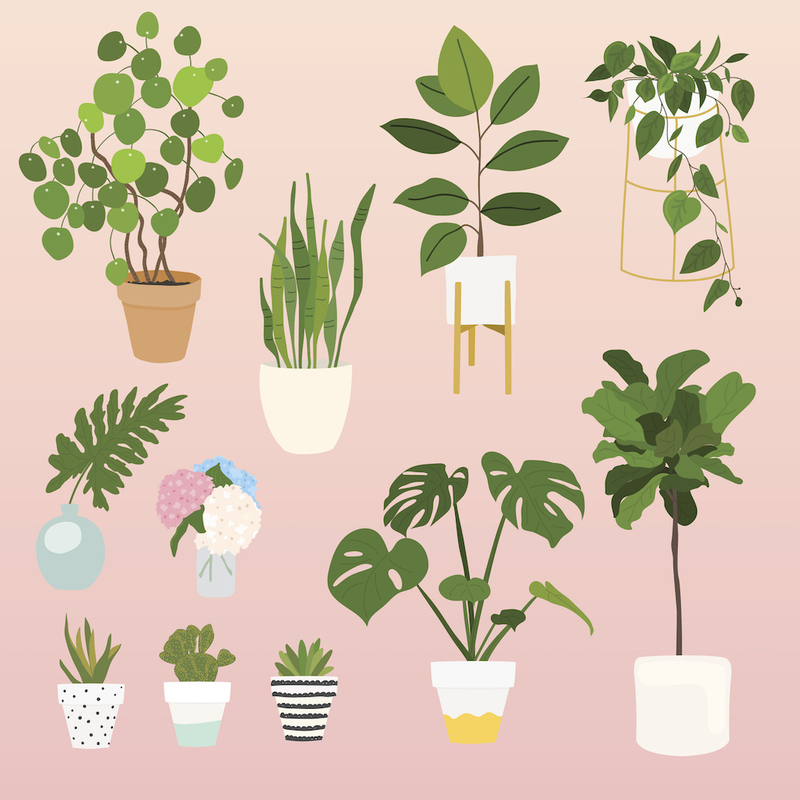 Whether you want to add just one or all 12 to your living space, give your indoor green thumb a try with the best plants for apartments.